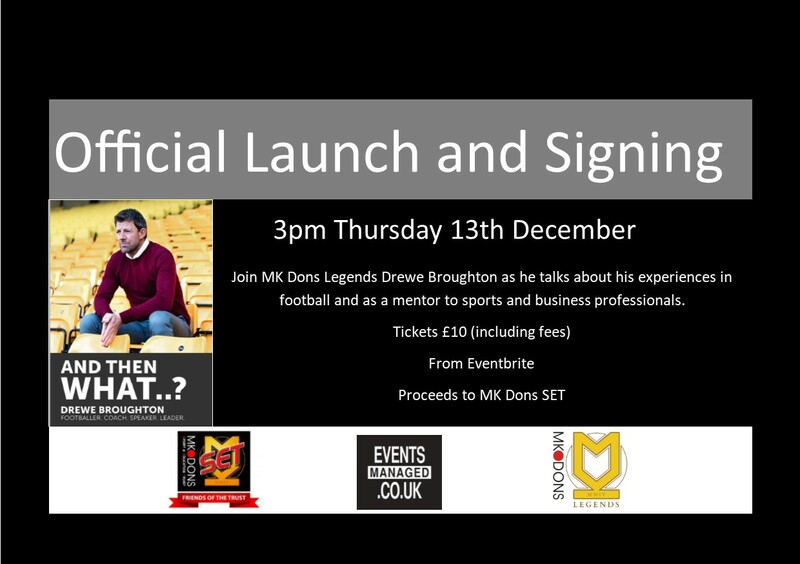 Join MK Dons Legend Drewe Broughton to launch his new book ‘And Then What?’ which explores what it actually takes to become who and what you are capable of, whether you work in the world of sport or business. Drewe will read excerpts from his book, whilst elaborating on some of the stories and how he has now helped both sportspersons and businesses alike with his no-nonsense approach to creating the right mindset. Tickets include light refreshments and a donation to MK Dons Sport and Education Trust (Charity 1123762) as part of the MK Dons Legends match fundraising. Copies of the book will be available to purchase on the night and from the MK Dons Club Shop afterwards. Next Post Your chance to play alongside an MK Dons Legend!